I Have a Blog? Oh Yeah…..
No excuses about huge the lapse in posting here. I am just going to move forward and today seems like a good day to do it. I am not going to go and ramble on about what we have done since January I am just going to start with some of what has gone on this past weekend with the wildlife around our home. 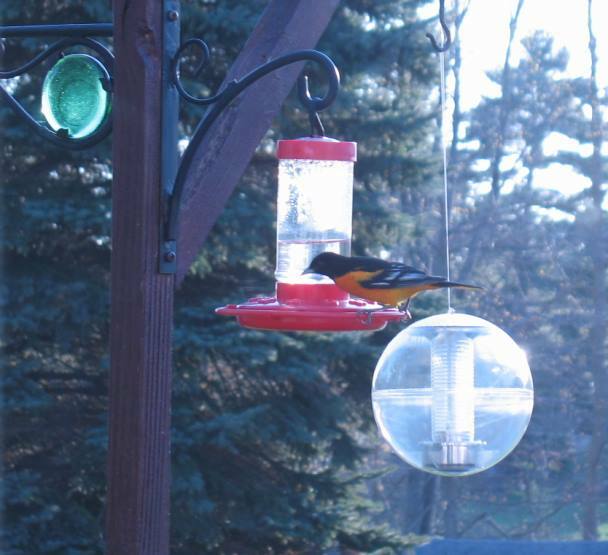 We have had quite a few bright orioles show up at our humming bird feeder this spring. They normally come for just a couple days and then leave not to be seen until the following year. When I took this picture there were three orioles fighting to eat. They just didn’t want to get their picture taken together. They also fight with our hummingbirds for the nectar so the feeder has been extremely active. Saturday we were outside and the neighbor came and got us to show us the visitor in his front yard. 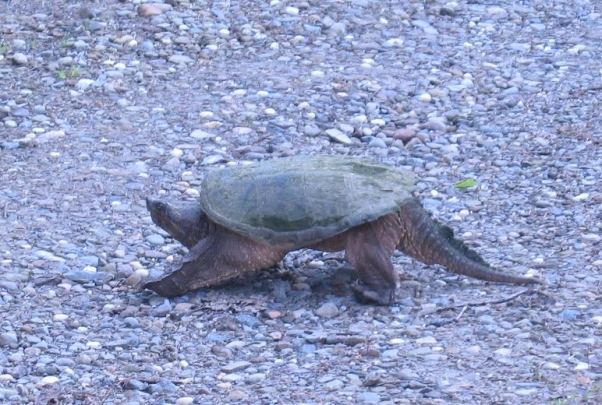 He had just mowed the grass and luckily didn’t hit this snapping turtle! This turtle was a good size. He was 16 to 18 inches round and when he decided to start walking we were all surprised about how long his legs were! We are not too sure where he came from. We don’t have any lakes or ponds close to us. We do have our little garden pond with our decorative fish in and I hope he doesn’t decide to make that his new home! We’d lose our fish and frogs for sure. That was some of last weekend’s big events around here. I will be back in a more timely manner.